Using the ancient technique of embossing pewter (Metal Repoussé) combined with printmaking on paper you will immerse yourself in creativity. These techniques will combine on a wooden triptych of 11.5 inches Ht x 9.5 inches width (closed) and 18 .5 inches (open) to culminate in your own Byzantine “like” Icon. You will have an opportunity to express your unique ideas, whether they are serious or lighthearted and at the same time have fun in this mixed media workshop. We are so excited to be heading back to La Cascade for another adventure in southern France! La Cascade is the perfect venue for us to explore our artistic expression in a large sky-lit studio under the eaves of this 17th century house. May 2019 is spring time in France and we will let the beauty of our surroundings inspire us. Elitia and Lynn have collaborated on a number of teaching experiences. We always enjoy working at creating an instructive and memorable project that allows you to express yourself individually while using the techniques you will learn in the workshop. You will have a completed piece of artwork to take home and techniques to apply again and again in your own constructive fashion. Come join us for rose and poppy season in Durfort, Southern France! Durfort is nicknamed Cité du Cuivre (the copper city), for the prosperous copper artisan trade that exists there, in addition to artisan trades in leather, glass, basket-making and jewelry. Seven nights lodging at La Cascade in Durfort, France. La Cascade is a charming, 17th century house situated in this tiny medieval village. Your backyard is a lovely river with a cascading waterfall that welcomes you all day. All breakfasts, most lunches and dinners prepared by our own chef, Nese Pelt. Nese sources produce, meat, eggs, cheeses etc. from the local farms and neighbors. Her meals are delicious and healthy. Dinners include wine Nese pares with the foods and these are usually from the region. Excursions to explore nearby villages, museums and historical sites. 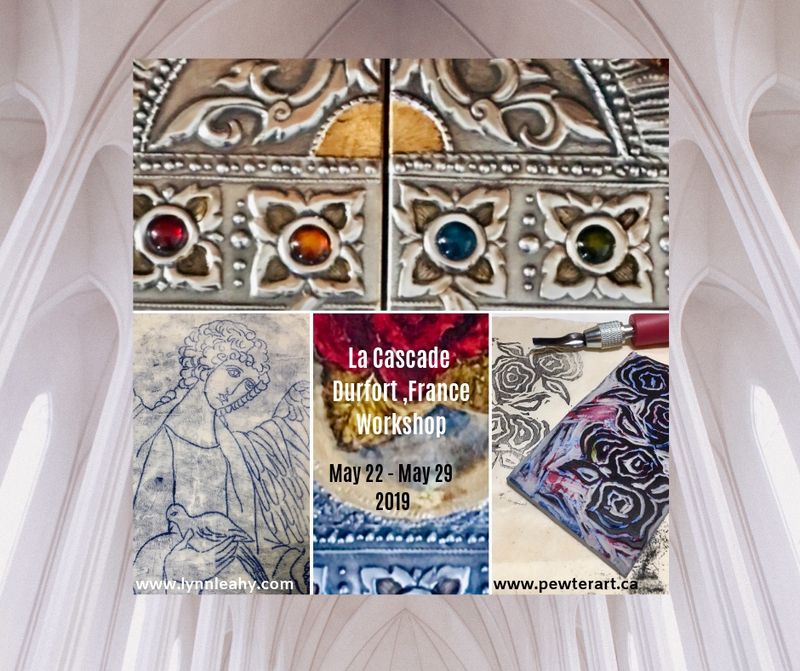 Workshop instruction in Pewter Repoussé and Printmaking. Metal embossing and printmaking tools (to keep), Triptych wooden substrate, precious lead free pewter sheet and all key supplies. Retreat fee is $2450.00 US dollars. A deposit of $500.00 is needed upon enrollment. Remainder is due by March 15, 2019.